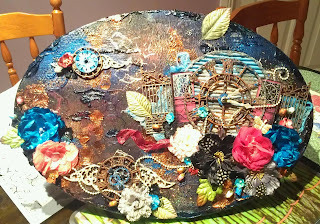 This is my newest creation going crazy with all the different clock pieces. This canvas has a TON of texture starting with a canvas covered in tissue paper, modelling paste with various stencils, heat embossing, glitter and covered with Lindy's Stampgang beautiful sprays! All chipboard, wood and metal pieces were altered with either sprays, paints or inka-gold.